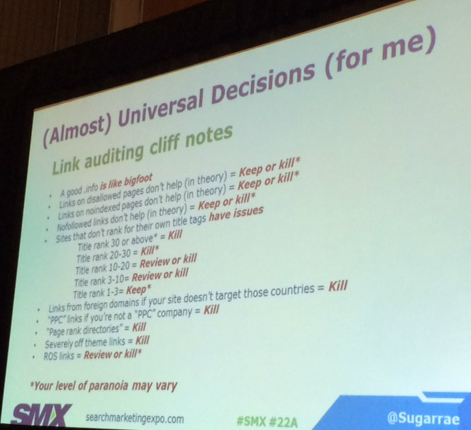 In this SMX West session you’ll learn how to assess whether or not your site has been affected by manual link penalties or by the Penguin algorithmic link penalty. You’ll also learn how to do backlink analysis with recommended tools and how to request link removals. Marie Haynes: Is Penguin Your Problem? Google has said time and again not to call Penguin a penalty but rather an algorithmic filter. It’s not reported in GWT as a manual action. A manual penalty reported in GWT is given by a human after review. Penguin meanwhile is algorithmic. Google Webmaster Trends Analyst John Mueller has talked about Penguin in both ways, sometimes saying “penalty” — so even Google is confused. This is really semantics. What’s practical is information on dealing with Penguin if it is effecting your site. 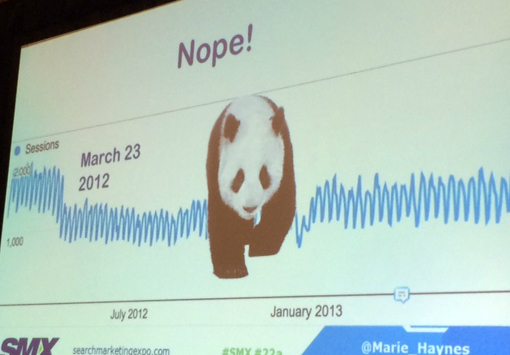 The date the traffic drop in this graph happened was March 23, 2012, which means it was a Panda penalty. It’s not always a huge drop. Matt Cutts has referenced “mild case” and “strong case” Penguin. Hook up your GA to the Panguin tool, which overlays your traffic to the dates of known updates. Look at Webmaster Tools impressions data that goes as far back as three months. SEMRush.com can give excellent data that you can compare to known updates. Got links? If you haven’t been cheating, it’s probably not Penguin. She believes that negative SEO can happen, but in cases where she’s seen websites claim negative SEO, they have also had a history of non-Google-approved link building tactics. Sort a site’s backlinks by anchor text from the Ahrefs tool. She looks for a high percentage of links with keyword anchors. She gives warnings of a backlink cleanup process that does more harm than good and wants to make sure marketers don’t remove naturally acquired anchor text links with keywords. Speaker Rae Hoffman and moderator Alex Bennert at SMX West’s Penguin Penalty Prevention session. Sure, technically Penguin is a filter. And if that filter means I’m not showing up, that’s a penalty for all practical purposes. 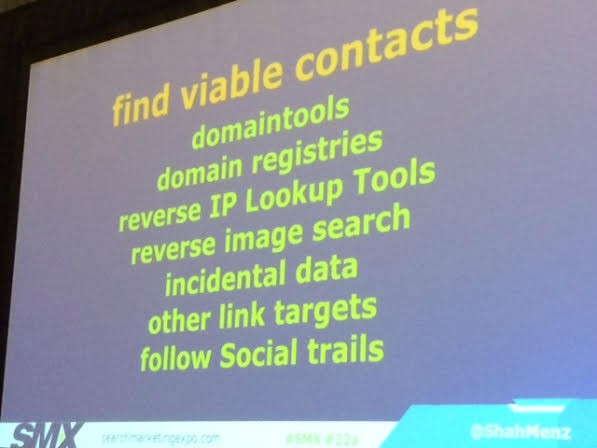 She’s seen cases where if you haven’t been building shady links, you generally don’t have to fear Penguin. On the other hand, it’s a pretty arbitrary filter so you may have to worry about it even if you thought you were doing legitimate marketing practices. This is not about your competitors. It’s about you and your site and not your competitors. If you’ve been hit by the Penguin algorithm or a manual penalty, this is the proactive process for auditing the backlink profile. Manual audit is like a fire sale: That link has to go! If you’ve created it and can’t honestly justify any value to the link outside of SEO? Even if your competitors have the same crappy links? Even if they’re from a once-approved tactic (e.g., guest blogging)? If Google cites an example link? Even if it’s “not fair”? If it has cherry anchor text? The more you try to do “just enough” before resubmitting your site for a reinclusion request, the more annoyed Google is going to get. 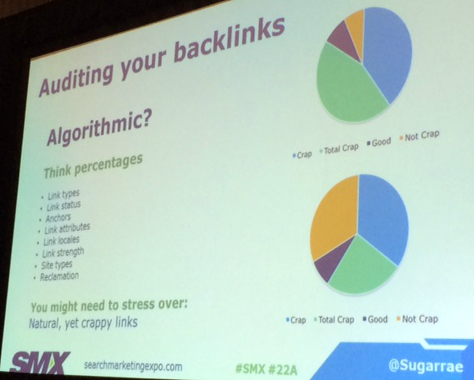 Don’t stress over “natural yet crappy links” when it comes to a manual penalty. Since a person is reviewing your backlinks, he or she knows that these links were created by the linking site for whatever reason and it didn’t have anything to do with you. Group the links together by type. Show you recognize why the links are bad and say that you won’t do it again. Algorithmic penalty audit: Think percentages of link types, link status, anchors, link attributes, link locales, link strength, site types, reclamation. You might need to stress over “natural yet crappy” links. In this case these throw off your percentages; disavow them. Always use GWT links and outside database + current disavow file. Use generalizations (see CliffsNotes below) to identify what is worth reviewing. You should do your best to hand review links that are in the gray area. If you have a lot of inks, you’ll need to over-rely on generalizations. Manual penalties need to use a machete. Algo penalties can take more of a scalpel approach. 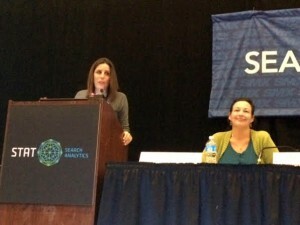 She uses linkresearchtools.com for segmentation and statistics. She does not look at the analysis they provide. She sees the stats and then makes the diagnosis. It’s a more expensive product at about $150 a month, but you can get it on a monthly subscription, which means if you have any revenue and get a Penguin filter, it’s worth it. You can use LRT to examine only links in your current disavow file. You can use LRT to examine only links GWT provides. Even if a domain is dead, still disavow it. LJR (link juice recovery) report on LRT can help with good link reclamation. Judge whether or not backlinks going to those pages are good and if you want to redirect that link to another page on your site. Run link audits on well ranking competitors to see their percentage breakdowns. The percentages vary heavily by industry. Does it pass the WIIWN (what if it were nofollowed) test? Proactively disavow? Sort of. Removing links is a negative hit on your site. She tells people that if you haven’t been hit by Penguin but know of some bad links to your site, build some good links first, then get rid of a few bad ones. You have to build new links before you can get rankings back after bad links are cleaned off the profile. For a long time, SEOs were gaming the system and it was like Candy Land. Today it’s like Risk. Wondering why you’re here today? You may want to know how to build great links! What if you smell fish. 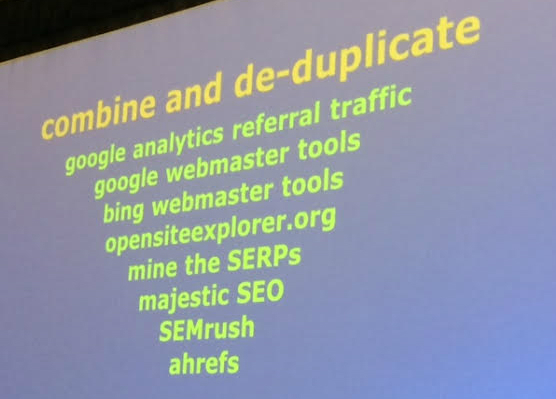 Your go-to tool is Google’s disavow tool. Does it work? Yes! Disavow files have multiple uses. Is disavow safe? Yes, but there are pitfalls to avoid. Site variants: Update disavows for all variants. When you update: The update is an overwrite. If you’ve disavowed in the past, add new data to old data, otherwise you’ll lose your previous disavows. Who remembers ASCII? UTF-8 or 7-bit ASCII is the preferred format of the file. Beware comment bloat. There is a 2Mb file size limit on the disavow file. Keep your comments minimal — they’re only there for you to see them. The best practice is to disavow entire domains. There are some specific edge cases, like if a nofollow link from a good page was obtained. Unseen links: No matter what tool you use, you’ll never see the full accounting of links from a domain. Zombie links: There are lots of cases of sites going down and coming back up again. For help managing disavow files, look at Disdit.com, a free disavow management tool. Generate entire domain disavows from a list of URLs. Add or remove domains for existing disavow lists. How long will it take? Disavowed links do not disappear from GWT. 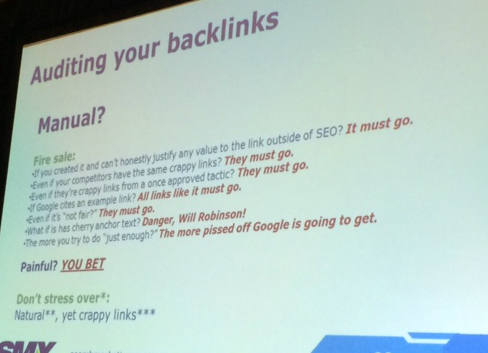 A good resource is this post at HisWebMarketing.com that explains how you can tell if a link has been disavowed. The attitude that will help you in the process: Love the process and own your mistakes. You are what Google thinks you are unless you can prove otherwise. To get your data out of GWT use the SWAT GWMT Exporter. Or you may have access if you have Cognitive SEO link navigator or Web CEO. Use links:domain.com + “keyword phrase” in Google and you may see links you haven’t seen yet. Ultimate Guide to Manipulative Links from Spamflag, a Chrome extension that shows you info about your links from the browser. They recently added multiple domain support. It’s free. Ayima is great for when webmasters are playing games. It shows you redirects that are happening in the background. Use Agent Switcher is a Chrome extension that helps you identify cloaking and hacking. MajesticSEO has a LinkMaps tool that will uncover possible issues with geographic relevance. Send email (be honest, helpful and don’t treat webmasters as the enemy). If you think 20 percent of link cleanup is a good result, you need to try harder. Think outside the mailbox: Adapt link acquisition ideas to step up your link removal game. She gives an example of a link removal request that had pirate language. They had a great cleanup response and were featured in Search Engine Land — link win! Golden rule of link removal requests: Be smart, creative, human and protect the brand.